Baxter came to Vet HQ with a bleeding wart. If your dog has ever had a wart accidentally knocked, you will know that they can bleed and bleed and bleed! 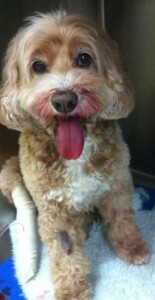 The strange thing in Baxter’s case was that he also started to bleed from his mouth. He had been chewing on a pizzle treat so there was a possibility that he cut his gums. He was otherwise perfectly well. When examined, Baxter was bright, happy and his vitals were all within normal limits. We were not able to find the location of the bleed within his mouth as it seemed to be oozing all around his gums with no obvious cut. As we examined him further we noticed some skin bruising under this thick coat of hair and then some blood in his faeces. Even when critically ill, Baxter had a smile on his face. You can see the blood stained moustache from his mouth bleeding and the bruise on his right arm. We immediately sent bloods to the lab to try to work out why Baxter’s blood was not clotting. In these cases we need to rule out the possibility of rat bait ingestion, ingestion of some human medications such as warfarin, trauma, a vascular disease or diseases affecting the body’s platelets or red bloods cells. All of these conditions cause the same symptoms and all have different treatment requirements. 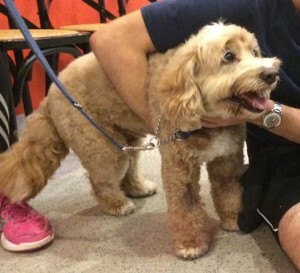 The blood results indicated that Baxter had “idiopathic immune mediated thrombocytopenia”. This is a serious autoimmune disease where, for no known reason, the body views its own platelets as “foreign” and starts attacking and destroying them. Platelets are the component of blood which causes clotting and scabs. Without platelets, tiny vessels in our gums would bleed just from chewing food and as the food goes through our gut it would cause bleeding there too. Even the action of just touching skin or brushing hair can cause bruising of the skin without platelets. Healthy dogs should have a platelet count of at least 200. Poor Baxter had a count of 4! He was in a very critical condition. We called Snap to the rescue and he donated half a litre of blood (which contains platelets) to Baxter to save his life. 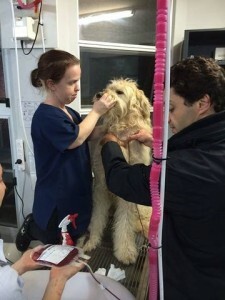 We also gave Baxter steroids to stop his body attacking the platelets and a chemotherapy drug which stimulates the release of platelets from his bones. 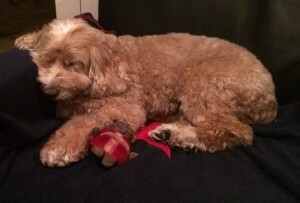 Baxter responded really well to the treatment and was able to go home the following night. He is still not out of the woods and will have to be taking daily medications to stop his body from attacking his platelets again. But the great news is that within a week his platelet count is back in the normal range sitting at 247. If you ever notice any bleeding, bruising, bloody poo, black poo or red spots on your pet’s skin please contact us at Vet HQ immediately.